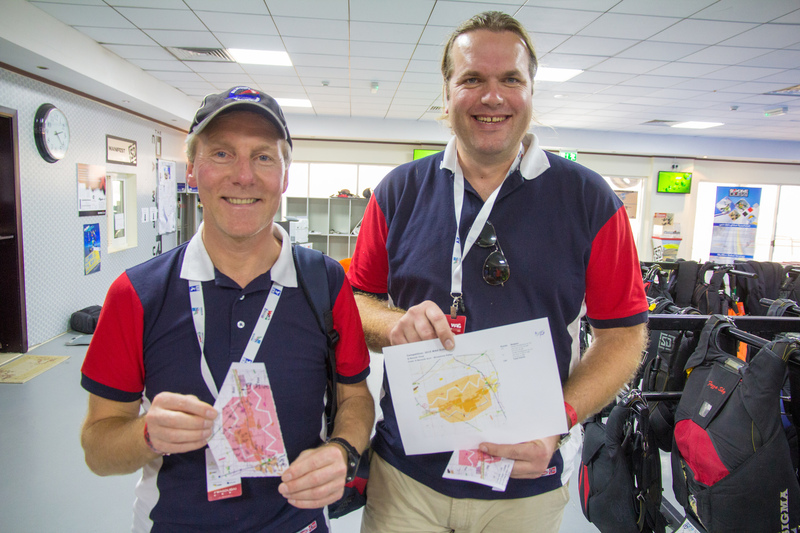 Norwegian pilot Kurt Norevik and navigator Petter Strømme flew their way along an unmarked corridor in the desert using only a compass, a stop watch and their eyes to win the Air Navigation Race at the FAI World Air Game. The pair were among 14 teams competing in this new race designed to test piloting skills, held at the Desert Dropzone. Spectators followed the pilots as they flew the course via live tracking online. The final task required them to fly along a zig-zag flight corridor marked on their paper maps which was only 360m wide, and they had to maintain an average speed of 80 knots - all without using a GPS to find their location. "At the end, we had the feeling this task was really difficult," said Norevik about the final. "Two turn points were in the middle of nowhere, with no reference points." Navigator Strømme used a stopwatch to call out turn times and set their course based on landmarks they'd passed earlier. The pair only picked up penalty points in two locations, and hit their start and finish gate with perfect timing, beating the Polish team into second place. The duo have been flying together for 10 years, but this is first time this competition format has been used internationally. It's run alongside a spot landing contest, and medals for both competitions are being presented tonight at the Palm Dropzone.